Travelling again with Compagnie du Ponant reminds me that the world of expedition cruising is changing rapidly. The older, much loved and trusted vessels of the former Soviet oceanographic fleet and converted Baltic ferries are seeing their final years as this new echelon of state-of-the-art, purpose-built, environmentally friendly ships takes their place, luring those previously sitting on the fence with adventure cruising. While I personally hope there will always be someone like NZ's harder-edged Heritage Expeditions continuing to offer wafer-thin niche voyages to unheard-of locations, the expedition sector is fast becoming more mainstream and it falls to companies like Ponant with their mix of modern, supremely comfortable ships and exciting destinations to take up the reins. I might lament that expedition cruising is no longer the sole domain of the determined and resilient eco-adventurer, yet more people than ever before are visiting the world's special places. Hopefully the more who do will vow to keep them special. This trip also afforded a glimpse of Iceland, a mid-Atlantic country more recently known for economic collapse and unpronounceable volcanoes. Personally I found the otherwise overlooked little folk museums at Hafnarfjörður just near the wharf enthralling. Geysers are great, but humans make history. Greenland, where we will spend most of our time on this cruise, is experiencing unprecedented melting of its huge ice cap. Glaciers are collapsing, filling the bays with bergs made of millennia-old ice while Inuit hunters who once patrolled in seal-skin canoes and harpoons, now motor out with rifles and come home to demountable cabins. Just as well too I remembered to pack my tie as the call-up came to join Captain Etienne Garcia at his table for dinner. Captain Garcia, like so many modern ships' masters, is an agreeable combination of decades of nautical experience, a personable, congenial character and a keen eye for public relations. With a firm command of English, albeit with a thick Gallic flavouring, he enthralled the table with tales of his seafaring adventures with an obvious and justified pride in his current command. "I'm looking forward to scouting Kamchatka with Nicolas (Dubreuil) our chef d'expédition," said Capt Garcia, "we're going to charter this little Russian boat, with maybe just six cabins to explore the new territories we visit with Le Soléal next year. Our Northwest Passage will be a marvellous too." With Le Soléal, the third vessel of this type (Le Boréal being the first and prototype) joining the Ponant fleet next year, it follows that the company will be looking to add more enriching voyages to the sailing calendar. As you read this, the other three Ponant vessels are enjoying some hedonistic cruising in the Mediterranean, although Le Levant leaves the company in November to join Paul Gaugin in Tahiti. 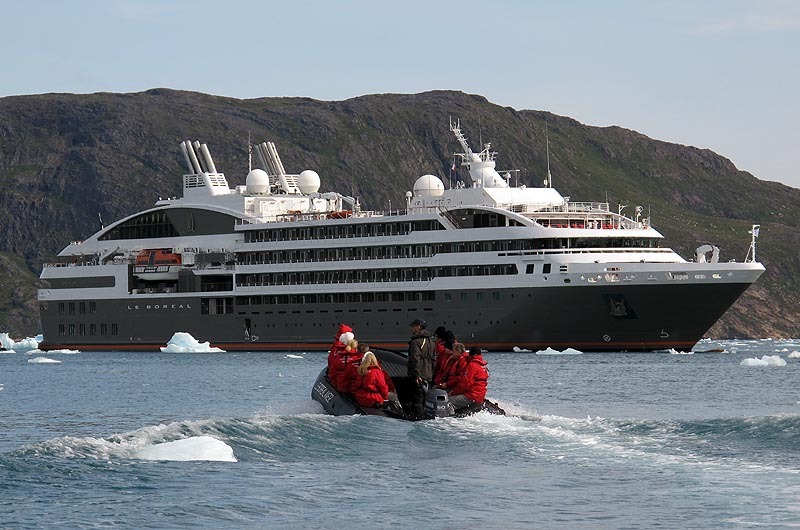 Le Diamant was sold last year and is now cruising as Ocean Diamond under charter to Quark Expeditions, while the namesake sailing ship, Le Ponant, will remain as company mascot. An Antarctic expedition is an experience where most people only can dream of... Thanks for sharing! !